The Boeing 737 is the best-selling commercial aircraft in aviation history over 15,000 aircraft ordered. 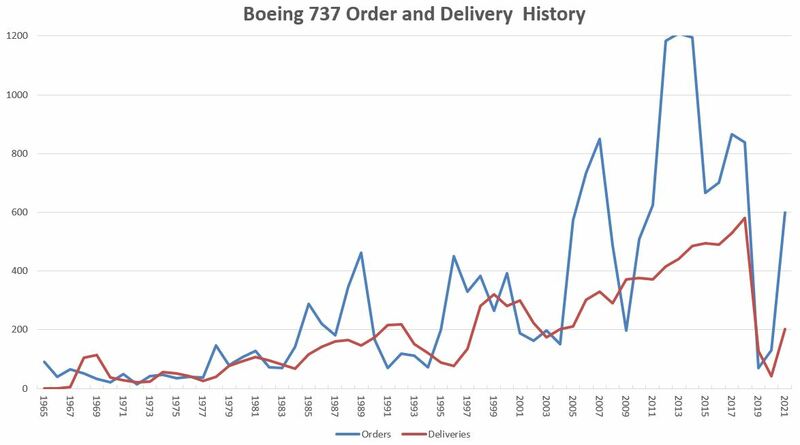 In 2013 Boeing took net orders for 1208 737s; that stands as the most of any model by any major commercial manufacturer in history. By 1 Jan 2019, the total number of 737NGs ordered was over 7000, 70% of which were for the -800 series. By 1 Jan 2019, the 737 had sold 15,207 aircraft and had an order backlog of 4,763 aircraft, including more than 5,000 orders for the 737 MAX. This is about one-third of the entire order backlog for all large commercial jets built by Boeing and Airbus. Even with the rise in production rate to 52 per month in 2018, if there were no further orders this would ensure the 737's production until at least 2027. 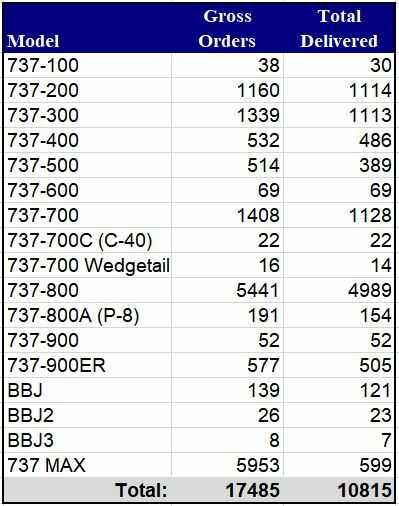 One of the more difficult questions to answer is “How much does a 737 cost?” The answer is not that straightforward. It depends upon series, customer options about avionics and cabin fittings, and most significantly size of order and when it is placed. In February 2005, Ryanair placed an order for 70 737-800s with options for a further 70. The public list price was between $61.5 million to $69.5 million per aircraft as given on Boeing's Web site. However because of the size of the order and the fact that it was placed when Boeing had being losing a significant amount of orders to its rival Airbus, it is widely believed that Ryanair paid less than $51 million each; and by the time other concessions such as credit and allowances, support services and free winglets are factored in, the price could have been as low as $29 million - less than half of the list price. In January 2016 United placed an order for 40 737-700s, which had a list price of $80 million, for about $23 million each. Ray Conner, Chief of Boeing Commercial Airplanes told Boeing employees that Boeing had lowered its price dramatically to win the order against “aggressive” competition from the new Bombardier CSeries jet, specifically to block Bombardier’s new plane from getting a foothold in the market. There follows a collection of recent news items concerning 737 orders, deliveries and fleet movements. Off the back of President Trump’s recent visit to China, Boeing has announced the signing of a deal with Chinese Development Bank (CBD) Aviation, the global aircraft leasing business of CBD. The detail will entail Boeing selling a total of 60 aircraft to the Chinese firm – 42 737 MAX 8s, 10 737 MAX 10s and eight 787-9 Dreamliners. With a total of 52 of Boeing’s MAX airliners being sold in the agreement, the total number of MAX aircraft sold throughout the range’s history now exceeds 4,000 – a significant milestone for the aerospace manufacturer. “Being one of the launch customers of the MAX 10 and bringing the MAX family's orders over the 4,000 milestone further demonstrates CDB Aviation's steadfast efforts to advance its global mission and deliver the latest technology aircraft to current and prospective customers,” said CBD Aviation President and CEO Peter Chang. Iran’s Aseman Airlines has agreed to buy 30 737 MAX jets for $3.0 billion in its second major deal since sanctions were eased last year. “Boeing confirms the signing of a Memorandum of Agreement (MOA) with Iran Aseman Airlines, expressing the airline’s intent to purchase 30 Boeing 737 MAX airplanes with a list price value of $3 billion,” the US group said in a statement. “The agreement also provides the airline with purchase rights for 30 additional 737 MAXs,” it added. If finalised, delivery is expected to start in 2022, Boeing said, adding that a contract of this magnitude “creates or sustains approximately 18,000 jobs in the United States.” Iran has been desperate to renew its ageing fleet of planes, but was largely blocked from dealing with major aircraft manufacturers until a 2015 accord with world powers that eased global sanctions in exchange for curbs to its nuclear programme. The US has maintained its own sanctions, which block almost all trade with Iran, but plane manufacturers were given a specific exemption under the nuclear deal. In September, Washington approved the sale of 80 Boeing and 100 Airbus planes to Iran Air. The first few Airbus jets have already arrived in Tehran. The new deal with Aseman will also need approval from the US Office of Foreign Assets Control. “Boeing continues to follow the lead of the US government with regards to working with Iran’s airlines, and any and all contracts with Iran’s airlines are contingent upon US government approval,” the company said. Many US lawmakers have opposed the sales, saying that Iranian airlines have been used to ship weapons and troops to Syria and other conflict zones. Iranian conservatives have also criticised the purchases, saying new planes will do little to improve Iran’s stagnant economy. Supporters on both sides have therefore tried to emphasise the employment opportunities. Even before the latest Boeing announcement, Iran’s Civil Aviation Organisation said plane purchases would create 20,000 direct jobs, and thousands more indirectly. “Currently, 500-700 co-pilots are unemployed in Iran,” CAO official Mohammad Reza Kazemimpour told the Iran Daily newspaper on Monday, adding that the new fleets would bring “tens of billions of dollars in revenues for Iran”. Meanwhile, companies across the world are waiting to see whether US President Donald Trump makes good on his campaign threat to tear up the nuclear deal. The first test will come in June when he will decide on whether to renew the sanctions waivers that keep the deal in effect. Aseman currently has a fleet of 36 planes -- half of them the 105-seat Dutch Fokker 100s. Its three Boeing 727-200s are almost as old as the Islamic revolution, having made their first flight in 1980. SEATTLE, Dec. 11, 2016 /PRNewswire/ -- Boeing [NYSE: BA] and Iran Air announced an agreement today for 80 aircraft that includes 50 737 MAX 8s, 15 777-300ERs and 15 777-9s, valued at $16.6 billion at list prices. Based on its Memorandum of Agreement (MOA) with Iran Air announced in June, the contract was reached within the terms of the U.S. Government license issued to Boeing in September. Boeing coordinated closely with the U.S. Government throughout the process leading up to the sale and continues to follow all license requirements as it moves forward to implement the sales agreement. Today's agreement will support tens of thousands of U.S. jobs directly associated with production and delivery of the 777-300ERs and nearly 100,000 U.S. jobs in the U.S. aerospace value stream for the full course of deliveries. The first airplanes under this agreement are scheduled for delivery in 2018. 23 May 2016 - Vietjet Orders 100 Boeing 737 MAX 200s. Vietjet has finalized an order with Boeing for 100 B737 MAX 200 aircraft, the largest ever commercial aircraft purchase in Vietnam’s aviation history. The deal is valued at approximately US$11.3 billion. 19 Feb 2016 - Air Niugini, the national carrier of Papua New Guinea, has placed an order for 737 MAX 8s. Air Niugini already operates the 737NG. This week United Airlines has announced a deal to buy 40 Boeing 737-700s, worth USD$3.2 billion at list prices. United likely paid well below half the USD$80.6 million list price for the 737s. The aircraft is being phased out as Boeing moves towards 737 MAX production. United's jets are due to start entering its fleet in mid-2017. And Southwest Airlines said it had converted orders for 25 737-700 into 737-800s and ordered 33 additional Boeing's 737-800s in a deal struck in December but announced on Thursday. China Southern Airlines, Asia's largest carrier by passengers, ordered 110 Boeing aircraft worth about US$10 billion. The Guangzhou-based carrier will buy 30 737NG and 50 737MAX models, valued at US$7.24 billion at list prices, the company said yesterday. China Southern-owned Xiamen Airlines also agreed to buy 30 737MAX planes for a total of US$2.88 billion before discounts. China Postal is the second carrier to sign for the 737 BCF programme, after Hangzhou-based YTO Airlines. Boeing says the order comes “pending a product launch”, and that it will support customers in the narrowbody freighter market with the 737 BCF programme. China Postal airlines already operates two 737-300QCs, 12 737-300SFs and eight 737-400SFs. 07 Dec 2015 - Egyptair to replace A320s with 737-800s. Egyptair is to lease another eight Boeing 737-800s from BOC (Bank of China) Aviation. The aircraft will be delivered from the second half of 2016. EgyptAir already has 20 737-800s. It ordered 12 in 2005-06 and another eight in 2009. It operates 10 A320s as well as four A321s. Some of which are approaching 25 years old andare among the earliest production A320s. The airline is undergoing a modernisation of its fleet through a strategic plan running to 2025. 24 Nov 2015 - Singapore-based lessor BOC Aviation has placed an order for 22 Boeing 737s comprised of 11 737-800s and 11 Max 8s. NEW DELHI: Jet Airways today announced the confirmation of its largest-ever fleet order for 75 Boeing 737 Max aircraft at the Dubai Airshow. "The order includes options and purchase rights for an additional 50 aircraft. The 737 Max incorporates the latest technology CFM International LEAP-1B engines, Advanced Technology winglets and other improvements to deliver greater efficiency, reliability and passenger comfort," said a release from the airline. It added that the transaction will be completely financed and managed through a sale and leaseback arrangement when Jet Airways takes delivery of the aircraft from 2018. Boeing [NYSE: BA] and Korean Air today finalized the airline's order of 30 737 MAXs. The airline also has options for additional 737 MAXs as part of the order, which was previously announced as a commitment during the Paris Air Show in June. With this order, Korean Air becomes Boeing's newest 737 MAX customer and now has 62 firm Boeing airplane orders on backlog. "Korean Air is a valued Boeing customer and today's order is the culminati...on of our longstanding partnership that spans over four decades," said Boeing Commercial Airplanes President and CEO Ray Conner. "Korean Air has been a pioneer in Asia's commercial aviation industry and today, we are truly honoured to welcome Korean into the new 737 MAX family. I am confident these new airplanes will play an important role in Korean Air's fleet modernization program for many years to come." “Today’s order for 27 additional 737-800NGs will be delivered over the next two years and will provide Jet2.com with the necessary cost effective, reliable and comfortable environment to allow us to build upon our already highly successful family friendly business” said Philip Meeson, Executive Chairman of Jet2.com. This is the first direct order placed by the airline, which owns an all-Boeing fleet comprised by 46 737s and 12 757s. 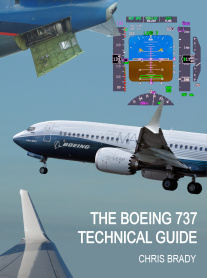 These new aircraft will be employed as a replacement of the current 737 classic in operation, hence allowing a standardization to a single 737 type.”We are extremely pleased to have finalized this order for more of what has already proven to be a popular aircraft within our fleet” Meeson commented. The airline will also take advantage of this order to expand its network, which currently reaches 55 cities across 364 holiday resorts from 7 departure bases. Copa Airlines formally signed (10-Apr-2015) an order with Boeing for 61 737 MAX aircraft, covering 737 MAX 8 and MAX 9 variants. The aircraft were previously listed on Boeing's Orders and Deliveries web site to an unidentified customer. The order is valued at USD6.6 billion at list prices. Copa will use the aircraft for replacement and to support plans for strategic growth. Copa will be the first airline in the region to operate the 737 MAX 9 on “deep” South American routes, as well as on its long-haul route network. To date, Boeing has accumulated 2,715 737 MAX orders from 57 customers. Air China and Boeing confirmed (22-Dec-2014) that Air China has committed to purchase 60 737s, including 737NG and 737 MAX aircraft. The commitment when finalised will be valued at more than USD6 billion at current list prices. The order will be posted on Boeing's Orders & Deliveries website once all contingencies are cleared. Air China said deliveries are scheduled from 2016 to 2020. The purchase will boost Air China’s fleet capacity by around 8% available metric-ton kilometre over Dec-2013, excluding adjustments to fleet structure such as the disposal of old aircraft. The actual payment will be less than the USD5.9 billion Jul-2012 open-market aircraft basic price because Boeing granted price concessions, including credit memorandums, Air China said. The carrier will pay cash in installments, using cash from operations, bank loans and unspecified financing instruments. Boeing and Jetlines today announced an order for five 737 MAX 7s as the new Canadian ultra-low cost carrier builds its future fleet. The order, valued at $438 million at current list prices, includes purchase rights for an additional 16 737 MAXs. "This agreement with Boeing is a major milestone for Jetlines," said Jim Scott, CEO of Jetlines. "We are thrilled to be partnering with Boeing and look forward to introducing the 737 MAX 7 into our fleet." The new airline, headquartered in Vancouver, British Columbia, plans to tap into passenger demand by offering low cost airfares on routes that avoid direct competition with other airlines. "Boeing is proud to partner with Jetlines as it begins a journey to offer low airfares to passengers across Canada," said Brad McMullen, vice president of North America Sales, Boeing Commercial Airplanes. "The 737 MAX 7 is perfectly suited to the airline's needs, and we appreciate the confidence Jetlines has in the airplane." Monarch Airlines announced it intends to order 30 Boeing 737 MAX jets on Monday at the Farnborough Airshow in a deal worth over $3 billion. The company said via release that it was working to finalize terms and set a purchase agreement for the jets. It will be limited to only MAX 8 airplanes that will be powered by LEAP-1B engines. CFM values the engine order, when finalized, at $1.9bn at list price, including a long-term service agreement. Under the terms of the Rate per Flight Hour (RPFH) service agreement, CFM will guarantee maintenance costs for all 60 LEAP-1B engines on a dollar per engine flight hour basis. The order has been expected for several weeks, after the carrier confirmed it was in talks in early July. The order, once finalized, is big win for the American manufacturer, which managed to flip the UK carrier from its current all-Airbus narrow-body fleet. It comes as a moderate blow to Airbus, which makes up the majority of the carrier’s fleet, including all of its narrow-body, single aisle airplanes. Monarch had been debating between the MAX and Airbus’ A320neo family. So far in the narrow-body market carriers had instead been bailing on Boeing, choosing Airbus products instead. Ryanair Holdings Plc (RYA) may buy as many as 200 of Boeing Co’s newest narrow-body jet, the 737 Max, later this year after placing a record-setting order for the model that’s being phased out. Ryanair’s commitment to buy 175 of the existing 737-800 models, with a catalog value of $15.6 billion, is Boeing’s biggest European sale and will let the Dublin-based carrier add discount flights in markets vacated by full-service rivals. Ryanair may become a “lead customer” for the re-engined Max, with an order of 100 to 200 by year-end, Chief Executive Officer Michael O’Leary said. A Max order may help Boeing catch up to Airbus SAS’s new A320neo, which has outsold its rival and is set to enter service two years earlier. Airbus’s sales success makes it unlikely for Ryanair to get the discount it would want to buy the plane, O’Leary told analysts. Europe’s biggest low-cost carrier last placed a major order in 2005 and has been contemplating a new deal for more than three years with deliveries from Boeing having ended in December. The carrier got a heavy discount on the last purchase and the new accord has similar terms, with “slightly higher prices,” O’Leary said. Airbus Chief Operating Officer John Leahy spoke last week of an ongoing price war between the two planemakers, though Conner told investors March 4 that the aggressive pricing pressure to get initial Max orders had subsided. He also said Chicago-based Boeing would “be OK” on the so-called bridge pricing on the final orders for the current model. Ryanair rose 4.8 percent to 6.08 euros in Dublin. Boeing advanced 0.4 percent to $85.51 at the close in New York. The new jets, scheduled for delivery between late 2014 and 2018, will permit 5 percent annual growth and take passenger numbers above 100 million from 79 million in 2012, Ryanair said. A Max order would address expansion through 2019. “This puts Ryanair back on a growth track which they were at risk of not seeing,” said Donal O’Neill, an analyst at Goodbody Stockbrokers with a buy rating on the stock. “We needed this order to fill the gaps left by the likes of Iberia in Spain and SAS in Scandinavia as the network airlines concentrate on long-haul and feeder services,” he said in an interview. Some 75 of the new planes will replace older ones, with the rest adding capacity, taking the total toward 400 aircraft, all of them 737-800s. The fleet might grow to more than 500 jetliners with a follow-on order that could reach a list price of more than $20 billion. Ryanair had said it was also considering Airbus A320 planes, which have nine fewer seats, as well as the C919 from Commercial Aircraft Corp. of China, a new entrant to the single-aisle market. Another option was to grab jet orders from rivals struggling to fund purchases, though secondhand prices are high, making that option unattractive, O’Leary said. The fleet deal will be funded from cash flow and debt, with some aircraft sold under so-called sale-and-leaseback arrangements. With capital outlays increasing this year and next, the Irish airline will hold off on further share repurchases and special dividends until 2015, it said. 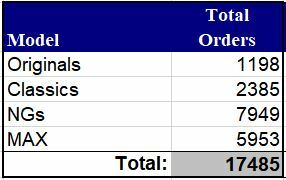 Today’s order, Boeing’s largest this year, comes after Airbus won commitments for more than 400 A320 aircraft in the past week from Deutsche Lufthansa AG (LHA), Turkish Airlines (THYAO) and Lion Mentari Airlines PT of Indonesia. The Ryanair contract helps fill up remaining delivery positions at Boeing as the U.S. manufacturer seeks to smooth the production transition from the current 737 to the Max model. The team evaluating the Max is probing several issues including whether buying the heavier model makes sense, since it will incur higher airport landing charges, O’Leary said. Boeing has increased the list price of its updated 737 Max aircraft by 4.5% for the first time since launching the plane last year. The 737 Max 8 and Max 9 now cost $100.5 and $107.3 million, respectively. The 737 Max 7, the smallest of the family, now sells for $82 million. Customers rarely pay the list price for jets, typically negotiating discounts, though pre-delivery deposits are based on the published price and will rise as a result of the latest change.